Local service airline Southern operated across the southeast from 1949 to 1979, but we won't attempt to go through its entire 30 year history here. That's best explained HERE. Southern, which merged with North Central to form Republic in 1979, is included here because its route system served as a virtual blueprint for numerous commuter airlines that followed (ASA in particular) and many ex-Southern Martin 404s became the workhorses of the commuter airline industry in Florida and Georgia through the late 1970s and early 1980s. Southern Airways route map from April 1, 1970 showing routes to many towns that have not seen airline service in decades. Also notable are the routes to New York, Newark and Washington originating from Columbus, GA.
Southern Airways Martin 404 at Atlanta in the early 1970s. The 1950s-vintage Martins would go on to serve with numerous commuter airlines in Florida and Georgia into the 1980s. The rapid growth of commuter airlines in Atlanta after the passage of the Airline Deregulation Act in 1978 can almost be entirely attributed to the equally rapid retreat of major and local service airlines from dozens of small cities across the southeast. At the time Deregulation became law, 4 large airlines were flying short-haul segments from Atlanta with relatively large aircraft: Delta, Eastern, Piedmont and Southern. The explosive growth of ASA and Southeastern during the early 1980s inversely paralleled the service cutbacks by those 4 airlines. Below: Southern was the last "major" airline in the U.S. to fly piston engine aircraft. Martin 404 N145S is seen on the ramp at Atlanta in November 1974. Southern's April 1, 1976 timetable shows M-404s flying from Atlanta non-stop to Anniston, AL, Athens, GA, Columbus, GA, Gadsden, AL, Greenville/Spartanburg, SC, Moultrie/ Thomasville, GA, and Tuscaloosa, AL. This particular aircraft, N145S, was originally built for Eastern and would later fly with Florida Airlines, Air South, Ocean Airways and Southern International as Air Florida Commuter. Swearingen Metroliner turboprops began to replace the Martins in 1977. While more economical and faster than the Martins, the sleek 19-passenger aircraft were often plagued by engine troubles and many passengers disliked the cramped cabin. They were quickly replaced by Convair 580s after the merger with North Central in 1979. N70A is pictured at Atlanta in 1978. 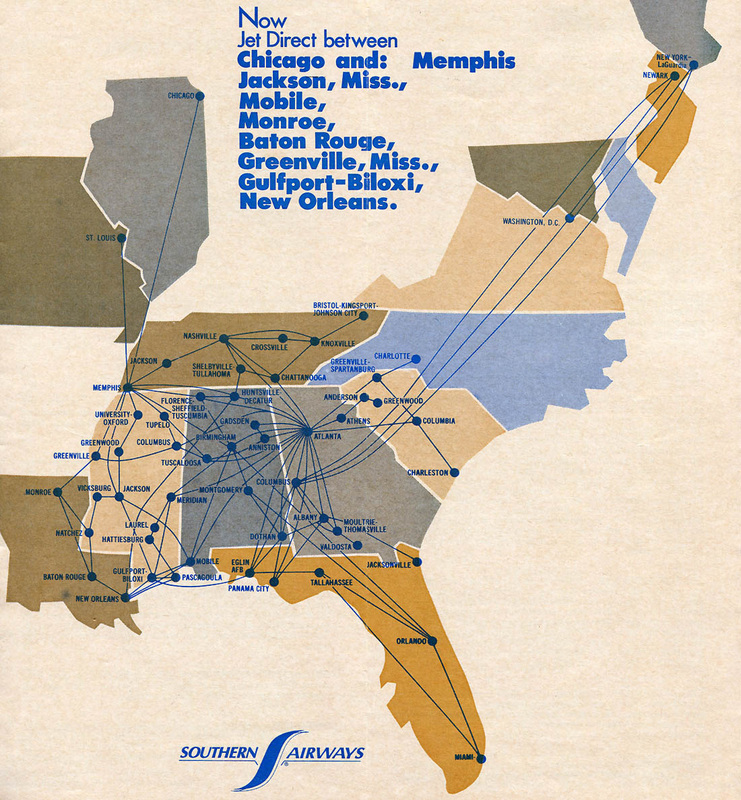 This map shows the routes flown by Southern Airways Metroliners according to the itineraries in the April 29, 1979 timetable. Created with Great Circle Mapper. DC-9s were flown from Atlanta to dozens of cities including small towns such as Albany, GA, Valdosta, GA, Dothan, AL and Tuscaloosa, AL. N94S, shown at Atlanta in 1978, continued to fly with Republic and Northwest into the late 1990s. Incredibly, several of Southern's old DC-9s continued to serve with Delta, after the merger with Northwest, until 2010. Southern merged with North Central Airlines on July 1, 1979 to form Republic Airlines. Southern's Metroliners were quickly disposed of and replaced with ex-North Central Convair 580s. The Convairs were too large for many of the routes they flew from ATL, and flights to towns such as Athens, GA, Moultrie/Thomasville, GA, Anniston and Gadsden, AL were soon dropped and taken over by ASA and/or Southeastern Commuter. Other airlines that have flown former Southern routes from ATL include Atlanta Express, GP Express, Skybus and Gulfstream International. Many cities once served by Southern and Republic no longer have airline service. Convair 580 N7743U (msn390) is pictured Atlanta Hartsfield Airport in March 1982. The aircraft continued to fly with Northwest after 1986 and Air Resorts into the early 1990s. This map from Spring 1980 was published by the Official Airline Guide in conjunction with Republic Airlines and shows the incredible density of the route network (shown in red) inherited from Southern Airways. The main airline abbreviations shown are: DL-Delta, EA-Eastern, NA-National, NW-Northwest, PI-Piedmont, QH-Air Florida, RC-Republic . The Convair 580s continued to fly from Atlanta to Tuscaloosa and Muscle Shoals until 1984, when the Atlanta hub inherited from Southern Airways was closed. N4805C (msn 60) is pictured in Republic's second paint scheme at Atlanta Hartsfield in 1984. It was originally built as a Convair 440 for Delta. After being converted to turboprop power, it flew with North Central, Republic, Northwest and Air Resorts. It is reportedly now stored in Venezuela.